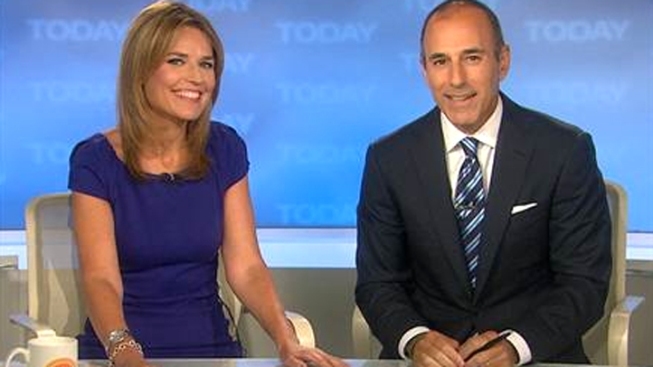 Savannah Guthrie joins Matt Lauer as "Today" co-anchor. Savannah Guthrie was officially welcomed as co-host of the “Today” show on Monday. "It's an honor to be here," Guthrie said at the outset of the program. She was treated to a montage of clips from her career assembled by producers. "7:02 and he's already calling me weird," Guthrie shot back. Guthrie takes over as “Today” co-anchor from Ann Curry, who signed off two weeks ago. Curry remains a "Today" anchor-at-large and a national and international correspondent for NBC News. "I'm so proud and honored to be in a place occupied by so many women that I admire," she said. “Ann, Meredith, and Katie, and Jane, Deborah, Barbara," she said. "I love being with you guys every day."